New York Polyphony have announced that their album, Sing Thee Nowell, has been nominated for a Grammy Award in the Best Chamber Music/ Small Ensemble Performance category. It’s the second Grammy nomination for the ensemble, who last received the honor for their 2013 album, Times Go By Turns. … it was, after all, Christmas music that launched the ensemble. 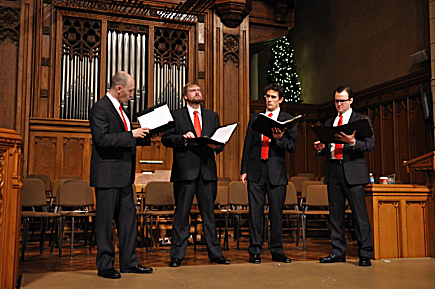 The four men had first met while singing in church choirs in Manhattan. “We knew immediately how much we enjoyed singing together and we talked over beers every now and again how we should try to form something, but nothing really came of it,” Williams recalls. That changed in 2006, when Malcolm Bruno, a producer friend of Williams, asked Williams if he might be able to put together an ensemble for a Christmas program. Williams and his friends recorded some tracks for Bruno and quicklv realized their sound merited further exploration. Those original tracks became the critically acclaimed album, I Sing the Birth, released on Avie Records. “We had a record deal and an album before we’d actually sung for anyone live,” Williams says. Sing Thee Nowell includes arrangements by longtime NYP collaborator Andrew Smith and was recently featured in Classical MPR Assistant Music Director Jennifer Allen’s holiday-album roundup.